In the whole world, wherever the vault of heaven turns, there is no land so well adorned with all that wins Nature’s crown as Italy, the ruler and second mother of the world, with her men and women, her generals and soldiers, her slaves, her pre-eminence in arts and crafts, her wealth of brilliant talent. Natural History, Book XXXVII, Chapter 77. Also quoted in Pompeii by Robert Harris. 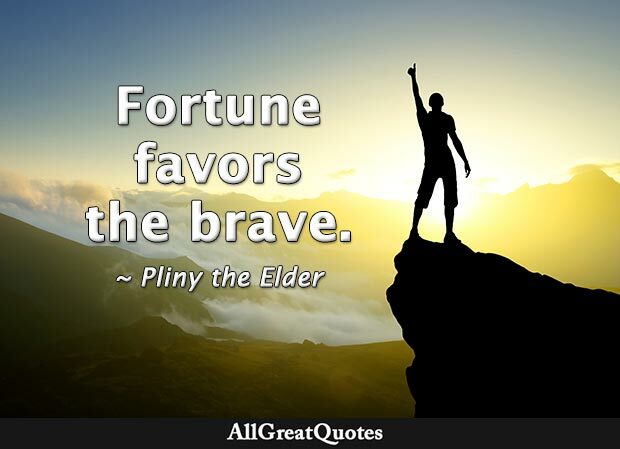 Attributed by Pliny the Younger to his uncle during the eruption of Mount Vesuvius. The Elder took his fleet to investigate in the hope of helping a friend and lost his life. Natural History, Book II, Chapter 5. Man is the only one that knows nothing, that can learn nothing without being taught. He can neither speak nor walk nor eat, and in short he can do nothing at the prompting of nature only, but weep. Natural History, Book 7, Chapter 1. Natural History, Book VII, Chapter 1. 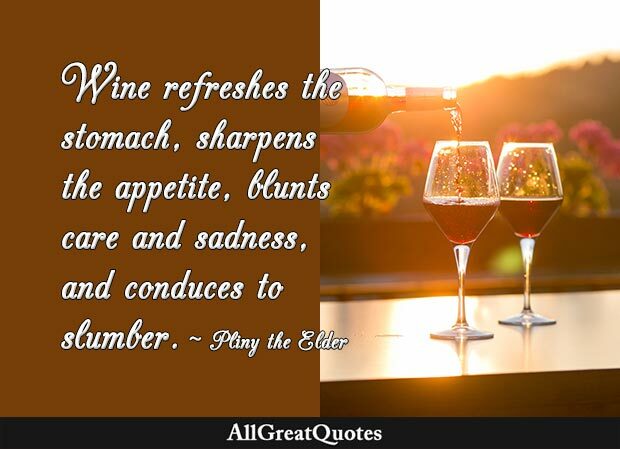 Wine refreshes the stomach, sharpens the appetite, blunts care and sadness, and conduces to slumber. Natural History, Book XXIII, Chapter 22. 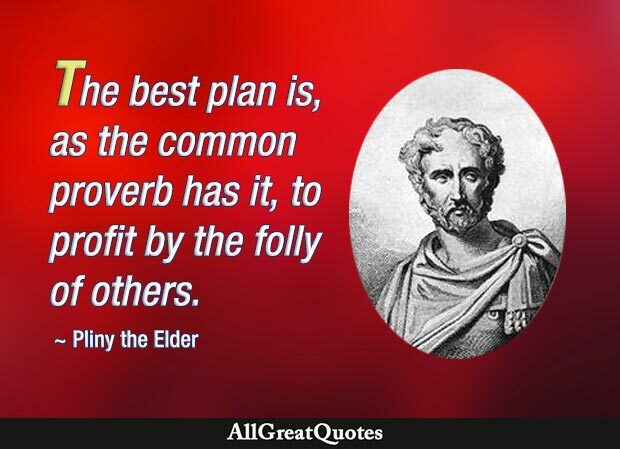 The best plan is, as the common proverb has it, to profit by the folly of others. Natural History, Book XVIII, Chapter 6. Natural History, Book XXIII, Chapter 77. Absentes tinnitu aurium præsentire sermones de se receptum est. It is generally admitted that the absent are warned by a ringing in the ears, when they are being talked about. Natural History, Book XXVIII, Chapter 5. Natural History, Book VII, Chapter 41. Natural History, Book XIV, Chapter 28. Nullum esse librum tam malum, ut non in aliqua parte prodesset. There is no evil without something good. Natural History, Book XXVII, Chapter 2. Natural History, Book VIII, Chapter 42. Haec est Italia diis sacra. This is Italy, land sacred to the Gods. Natural History, Book III, Chapter 24. Nature is to be found in her entirety nowhere more than in her smallest creatures. Natural History, Book XI, Chapter 1. 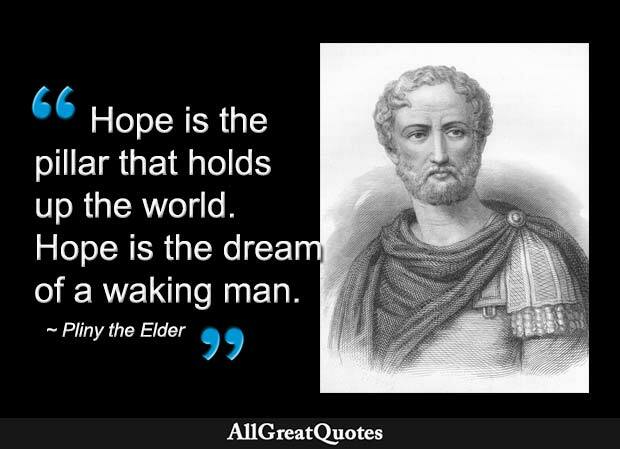 The agricultural population, says Cato, produces the bravest men, the most valiant soldiers, and a class of citizens the least given of all to evil designs. Thunderbolts that strike blindly and in vain. Natural History, Book II, Chapter 43. Contact with [menstrual blood] turns new wine sour, crops touched by it become barren, grafts die, seed in gardens are dried up, the fruit of trees fall off, the edge of steel and the gleam of ivory are dulled, hives of bees die, even bronze and iron are at once seized by rust, and a horrible smell fills the air; to taste it drives dogs mad and infects their bites with an incurable poison. Natural History, Book VII, Chapter 13. Natural History, Book XVIII, Chapter 8. Natural History, Book I, Dedication. Shellfish are the prime cause of the decline of morals and the adaptation of an extravagant lifestyle. Indeed of the whole realm of Nature the sea is in many ways the most harmful to the stomach, with its great variety of dishes and tasty fish. Natural History, Book IX, Chapter 53. A bad bargain is always a ground for repentance.